Cooler Master introduces the HAF XB, a new LAN box that's shipping for $99.99. The case measures 442mm x 330mm x 423mm (W x H x D) and weighs 8.2kg, it supports Mini-ITX, Micro-ATX and ATX motherboards, and has room for two 5.25" drive bays, two 3.5" HDs, six 2.5" SSDs, and seven expansion cards. 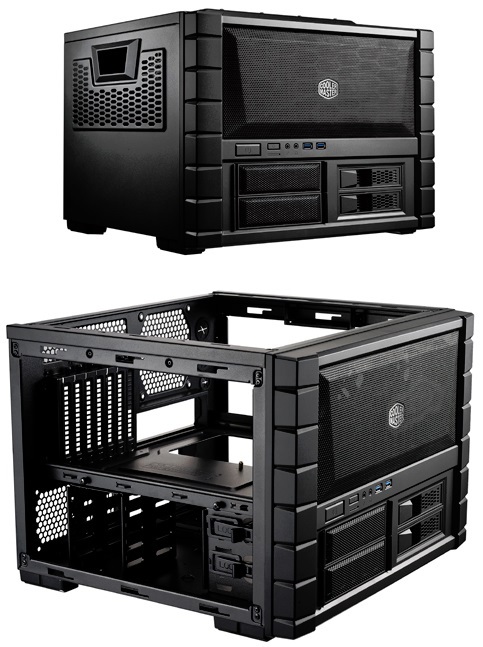 The HAF XB has a removable motherboard tray and supports CPU coolers as tall as 180mm and graphics cards as long as 334mm. The case features carry handles on the side panels for easy transport, and can be transformed into a test bench. Cooling is provided by two 120mm fans, and there's room for an extra 120mm (or two 80mm) rear fan and a 200mm top fan. Cooler Master, an industry leading chassis, thermal solution, peripheral, and accessory manufacturer today unveils the LAN box that takes the form to a whole new height, HAF XB. Packing full ATX motherboard support, modular features, portability, and excellent cooling, HAF XB comes in as the LAN box to beat. HAF XB takes an innovative diversion from the form factor of its High Air Flow (HAF) brethren. It comes in a LAN box form that pushes the boundaries of size for this category. Ensuring that it continues the tradition of its namesake, HAF XB supports up to two 120mm fans in the front, a large 200mm in the top, and a 120mm and two 80mm fans in the rear. Strategically placed cable tie areas occupy cable routing zones to assist in keeping cable clutter to a minimum and provide a clean look with minimal effort. Steel reinforced handles on the side panels make traveling between LANs and other gaming destinations a far less stressful venture. Built to be attuned with the needs of enthusiasts and extreme overclockers alike, HAF XB transforms effortlessly between LAN box and Test Bench. To accomplish this, a simple removable motherboard tray design is included to make swapping hardware a headache-free experience. Removing the outer shell completes the transformation into a formidable test bench for any cooling need. Users of all types will enjoy seven expansion slots that offer space for multiple graphics cards setups in NVIDIA SLI or AMD CrossFire to vastly expand the capabilities of a system. Those interested in loading up their mobile fortress can setup a large HDD or SSD array with support for up to six 2.5” drives. This includes dual X-Dock slots for mounting hot-swappable 3.5” or 2.5” drives. A rich front I/O panel offers access to two super speed USB 3.0 ports, 2 x USB 2.0, and audio in and out. HAF XB, the ultimate combo LAN Box and Test Bench. HAF XB will be available on November 12th, 2012 in the U.S. and November 26th, 2012 in the E.U. Price and availability may vary by region.